Today we continue our exploration of Newark's manufacturing history with another look at some of the diverse companies that made their home here in the city. Today's smokers often use throwaway lighters. But in days gone by, when cigarette smoking by debonair movie stars and celebrities was considered the height of sophistication, the Ronson lighter was the jewel of the industry. Louis V. Aronson, the man who gained great fame for his invention, was one of Newark's greatest industrial leaders and philanthropists. Born in New York City, Aronson (1869-1940) learned his trade at the New York City Technical Institute as an electro-metallurgist and a practical metal worker. Before entering business for himself, Aronson was an instructor at the Baron de Hirsch School. 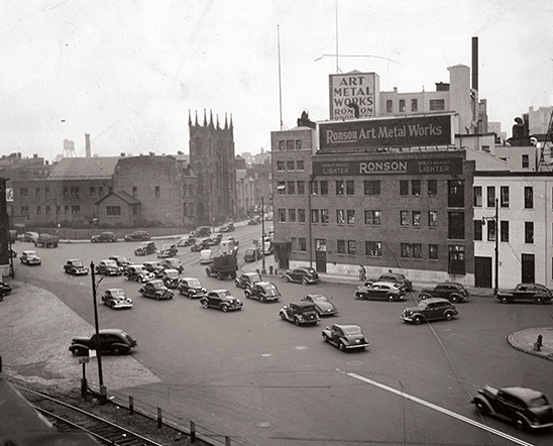 In 1895, Aronson moved to Newark and founded the Art Metal Works. Its headquarters was on Mulberry Street at Aronson Square, where it expanded to a 250,000 square-foot facility and produced Newark-made and stamped products including clocks, jewel cases, desk articles, toilet novelties, vases, candelabras, inkwells, calendars, religious and church goods, picture frames, statuettes, thermometers and articles for the smoker. The array of items produced included a nonpoisonous wooden safety match for the Belgian government and the 'ma-ma' voice for little girls' dolls. By the outbreak of World War I, however, the company developed the popular lighter for which it is perhaps best known. Ronson's slogan was 'Press, it's lit; release, it's out.' The original building at Mulberry Street was replaced by the Ronson Metals Corp. at 51-79 Manufacturers Place in the Ironbound. Over the years the company built up a worldwide reputation. In 1954, Ronson began to diversify, moving its corporate office to Somerset and creating four wholly owned subsidiaries, three in the United States and one in Canada. In addition to building a successful business, Aronson devoted much of his time to the Boys Club, the Aronson Cadets, the Newark City Home trustees, the Committee of One Hundred, organized to celebrate Newark's 100th birthday as an incorporated city, and the New Jersey Historical Society. Aronson was chairman of the building fund, which raised $1 million for the construction of the Mosque Theater. He supported Beth Israel Hospital and the Daughters of Israel Home for the Aged, overseas relief and Zionist causes, and was a pillar of Temple B'nai Abraham. He crafted a superb record as an enlightened and caring Newarker. And the product for which he is best known—the Ronson lighter—has become a collector's item. In an age of throwaway products, including cheap cigarette lighters, tabletop Ronsons from the company's early years are a hot item in the collectible market, sometimes worth hundreds of dollars. Thus a new generation has become familiar with the company name in a new way. In winding up our examination of Newark as a major manufacturing center, we turn to the cigar industry. Like the puffs of smoke it generated, this area of endeavor is almost completely forgotten but by a few that patronized the lost craftsmen of the rich, golden Havana leaf. The history of Newark's cigar-making era can be traced to the 1880s when Israel Lewis, a Lithuanian immigrant, opened his first shop in Newark after a two-year stopover in New York City. Here he began an operation in an old silk mill on Wickliff Street. At the turn of the century, he moved to 165 Morris Ave. After his death, Harry Lewis took over the firm's management, and, gradually, local cigar making turned from a hand operation to a machine one in the larger firms such as Lewis's. At one time the Lewis plant employed nearly 1,500 workers, but at the time of its closing, it had been reduced to 450 cigar makers. And those hardy few were fired the next year after a takeover by a Philadelphia firm. Until then, between 50 to 60 million cigars were turned out annually. Other major firms in business locally at this time included the American Cigar Co., Waitt and Bond and the Bayuk Co. Gradually, they also began shifting operations elsewhere. By 1955, the Lewis Co., one of Newark's oldest and largest cigar firms, was the city's last. Nevertheless, for 75 years Newark's cigar industry thrived. Waitt and Bond, a Boston firm begun in a suburban kitchen of Mr. and Mrs. Henry Waitt, opened a large and important plant here in 1919 with satellite operations in different parts of town. In 1929, operations were consolidated at 310 Sherman Ave., where new machinery made it possible to produce more than 1,100 cigars a minute. The ups and downs of the industry were reflected in 1904 with the revival of the 5-cent cigar. That burning development brought 500 Newark cigar workers back to the local workplace. The thrifty price made it possible for anybody to afford a good smoke. The situation again changed in 1917 with the imposition of a wartime tax of $9 per 1,000 that again drove up prices. The paradox of boom and bust was difficult to understand, for in the depths of the Great Depression sales rocketed to new heights. When peace and prosperity returned after World War II, sales again ebbed to a dangerous low. Despite the industry's fluctuation and the use of machinery in production, a handful of cigar handrolling artists remained to produce the perfect cigar for the discriminating smoker. 'Mr. Meyers, ' whose real name was Marshafsky, was a Lithuanian immigrant and cigar connoisseur. He collected cigars for his special customers and held court in his shop doorway at Broad and William each day for many years. There he would sit every afternoon 'waving an enormous club-shaped cigar as he greeted friends and invariably wore a cream-colored linen coat over his angular frame.' At 54 Clinton St., Arthur Jelling sold the finest Cuban imports. Nearby, a relative presided over five men who daily produced between 200 and 300 cigars for their special customers. Now this is all history. If you have ever smoked and enjoyed a good cigar, it's what you might call just a pleasurable leaf out of the past. Do you remember the name Flockhart? If you pay attention to detail, you may recall that the company made most of the manhole covers you cross over daily in downtown Newark. Established in 1882 as Maher and Flockhart, the company was known for a time as Maher, Robinson and Flockhart, named for the owners, Edward Maher, Thomas Robinson and James Flockhart. Like so many other important factories, the company had humble beginnings, with just one employee at the Polk Street shop. Eventually it grew into a foundry equipped with the latest improved cupolas, power cranes and appliances needed to facilitate the manufacture and handling of castings. Expert ironworkers considered the foundry one of the best. Heavy and light machinery made in the building often exceeded 60 tons a day. There was no form of cast iron that could not be produced at these works, making the line of products endless. By the turn of the century, the company had 250 employees, a number that grew to more than 400 by 1912. By that time, the company had expanded several times. In addition to manhole covers, products included all varieties of castings, catch basins, lawn drainage gratings, storm water frames and covers, surveyors' monument stones, tree frames for artificial sidewalks, and meter frames. Through the years the firm received many contracts from public and private companies from all over America and abroad. By 1912, James Flockhart took full ownership of the company. The next time you step on a Flockhart cover, you will know who made it and that it came from Newark. So, if you value good outdoor street lighting, the careful regulation of electric surges to your computer, fine finishes on old-time carriages or railroad coaches, your great aunt's Art Deco picture frame or clock, or the Ronson lighter that turned your locally made Havana into pure smoking pleasure, thank some long-gone Newarker who got there first, did it best and showed the nation how to do it with style. Next week we will take a break from our lengthy look at Newark's importance as one of the nation's greatest manufacturing hubs. Our focus will be Portugal Day and the Portuguese-American parade, an event that attracts thousands of people to the city on the first Sunday each June. The following week, we will examine why Newark was such a great manufacturing center.